Dr. Shane Trayers with a copy of the anthology. Photo by Alexandria Brooks. In 2009, shortly after taking a faculty position in the English department of what is now Middle Georgia State University, Dr. Shane Trayers founded the Macon Writers Group to create a community for writers living in the region. Still going strong a decade later, the Macon Writers Group meets on the last Saturday of every month except December at the Ampersand Guild in downtown Macon. 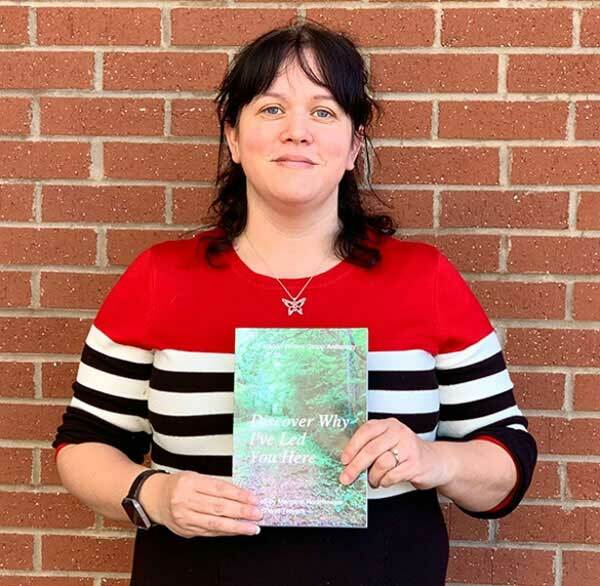 The group recently reached two milestones: publication of an anthology that includes the work of some members, and Trayers receiving the Community Engagement Award from MGA’s College of Arts and Sciences, an honor directly connected to her work with the Macon Writers Group. Today, as it always has, the Macon Writers Group welcomes all writers and aspiring writers, regardless of experience level. The group presents workshops, lectures, and social gatherings like an annual birthday party, “Shut Up and Write” events and writing marathons, as well as participating in local writers conferences. Once or twice a year the organization will host a professional writer workshop featuring special guests, such as Jack McDevitt, Sarah Hughes, Winsphere Jones, and Elizabeth Tammi. This past January, the Macon Writers Group celebrated its 10th anniversary with a party and the publication of the anthology, Discover Why I’ve Led You Here. An anthology of collected poetry, prose and essays, Discover Why I’ve Led You Here showcases works from 13 writers from the region, including several Macon Writers Group members and Middle Georgia State alumni and students, including Mea Andrews and Kaitlyn Rowe. The title itself comes from Vanessa Jimison’s “On Pierre Auguste Cot’s ‘Springime,’” a poem she wrote for Dr. Kelly Whiddon’s creative writing course. Group member Margaret Rodheaver used the experience to learn how to self-publish alongside editing the anthology with Trayers. The duo used an editing board to choose which works would be featured to ensure that a wide variety of pieces from local writers was included in the publication. Although the publication process was a long one, Trayers and the Macon Writers Group family found it to be an extremely rewarding and promising experience. The Macon Writers Group will hold its next meeting at 2 p.m. Saturday, March 30, at the Ampersand Guild in downtown Macon. Discover Why I’ve Led You Here is now available on Amazon. The writer, Alexandria Brooks, is an MGA senior interning for the University's Marketing & Communications office.